A new rhyme, tons of games, a science experiment, a culinary activity and so much more... This theme will have children bouncing with joy! Word flashcards, coloring pages, puppets, posters, stationery, an association game, and many more documents for discovering balls of all kinds! (Open thematic poster-Balls) Print, laminate, and display all kinds of posters. Hang several pictures of different types of balls along with inflated balloons from the ceiling in your daycare. 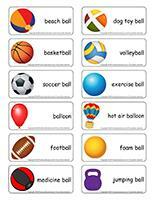 (Open educa-theme-Balls) Print and laminate the items that represent the theme. Use them to present your theme to your group (and parents) while decorating a corner of your daycare. (Open educa-decorate-Balls) Print, laminate, and cut out the various items. Use them to decorate your daycare and set the mood for the theme. (Open models-Balls) Print and let children decorate the garland. Cut it out and hang it within your daycare or near your daycare entrance. This special tool was created in response to a special request received. (Open perpetual calendar-Summer vacation) Print and laminate. Use the calendar to remind parents of the dates your daycare will be closed during summer months. 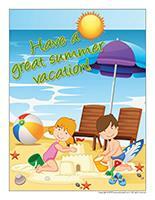 (Open poster-Have a great summer vacation) Print and display. Set your parachute on the ground and invite children to sit on it. Deposit all kinds of balls in the centre of your parachute and ask children to name the games they like to play that involve balls. Fill a bag with a variety of items that can be used for different types of games and present them to your group one at a time. Discuss each one. 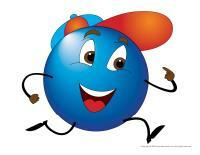 Use pictures and illustrations representing sports that involve balls to encourage children to speak. Ask children if their parents or siblings practice sports that require balls. (Open Poni discovers and presents-Balls) Print the cards. Laminate them and cut them out. Using a Poni puppet or another puppet children are familiar with to present the items to your group. The pictures may be used as a memory game or to spark a conversation with your group. Use them to decorate your daycare or a specific thematic corner. 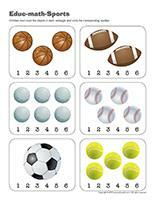 (Open picture game-Balls) Print, laminate, and store the pictures in a Ziploc bag or in your thematic bin. (Open picture game-Balls) Print each picture twice and use them for a memory game. (Open stationery-Balls) Print. You may use the stationery to communicate with parents, in your writing area, or to identify your thematic bins. 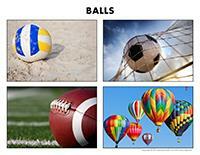 (Open word flashcards-Balls) Print and laminate the word flashcards. 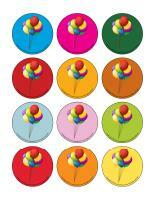 Encourage each child to pick one and present the item (example: hot air ballooon) to the group. Invite children to share what they know about each item with their friends. Ask children questions. (Open giant word flashcards-Balls) Print, laminate, and display the word flashcards on a wall within your circle time area or on a large piece of cardboard that can easily be moved around. Name a word and encourage children to take turns identifying the correct flashcard. (Open transition games-Balls) Print, laminate, and secure the illustrations on the floor to create a path which leads to areas frequently visited by children such as the bathroom or cloakroom. If you prefer, the illustrations may also be used to delimit your various workshops. (Open transition games-Balls) Print two copies. Laminate and cut out the cards. Glue one copy of each card on the table using adhesive paper. Drop the other copies in a bag. Children take turns picking a card to determine their spot at the table for the day. You may also use the cards to determine naptime spots or for your task train. Fill a large container with colourful balls of different sizes. Let children explore its contents. They will enjoy throwing the balls, rolling them, etc. Fill a kiddie pool with multicoloured plastic balls. Add tennis balls as well as miniature versions of balls used for a variety of sports. Let children throw the balls, manipulate them, and play with them as they wish. 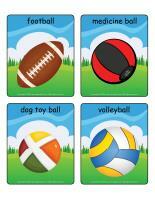 Offer several different balls and let children try to roll, throw, and catch them. We suggest you prepare a special game box that will help you pick and choose which ball games you will play with your group each day. Simply have a child pick a card. The different games are explained on the back of each illustrated card. You can take these cards everywhere. Use them indoors, at the playground, in your yard, etc. (Open game box-Balls) Print, laminate, and store the cards in a box or Ziploc bag. Have children sit in a circle. The leader of the game gently throws the ball in the direction of another child and says "hit" or "catch" at the same time. The child who receives the ball must respond by hitting or catching the ball, depending on the first child's instructions. If the second child misses, he/she must sit down. Set a small basketball net or bucket at one end of your daycare or yard and introduce your group to basketball. At first, use small balls that are easy to hold and manipulate. You can use a bigger ball once children have had some practice. Depending on their age and level of ability, you can eventually offer a real basketball. For this activity, you will need a parachute. Ask children to hold the edges of the parachute and stretch it out as much as they can at hip level to create a flat surface. Deposit a small ball on the parachute and show children how they can use back and forth movements and cooperation to make the ball fall through the hole in the centre of your parachute. You will need two baskets (a small one and a big one) as well as several balls (small ones and bigger ones). Children must take turns choosing a ball and tossing it in the correct basket, depending on its size. Divide your group into two teams. Use electrical tape to divide your playing area into two equal parts to represent a volleyball court. The players from each team hold a baby blanket. They must use their team's blanket to toss the ball into the other team's half of the court, without letting it fall to the ground. Adapt regular volleyball rules to children's abilities. Hang hula hoops on a wall or fence or simply deposit them on the ground. Invite children to stand a few feet away and attempt to throw small balls or bean bags in the circles. Deposit a ball on a blanket. Encourage children to take turns "throwing" the ball to one of their friends by rolling it on the blanket. They may sometimes have to ask the other children for help. Introduce your group to volleyball. Use a beach ball and show children how they can hit it by placing both of their open hands close together (set) or bump it by clasping their hands together. Once children have somewhat mastered these two techniques, divide your group into two teams and organize a short volleyball game. Set up two goals in your yard using cones or other items you have on hand. Divide your group into two teams. Children from each team attempt to kick the ball into the other team's goal. To encourage cooperation, you may choose to add a few rules with older children. For example, you may insist they pass the ball at least once before scoring. Build your own maze-like obstacle course. You can, for example, hang a rope that children must crawl under between two chairs or, if you prefer, you may have them climb over it. Set a bucket of water on a chair and have children crawl under it without spilling water on the floor. Use whatever you have on hand and invite children to help you create the obstacle course. Include obstacles that will make it possible for children to move in a variety of different ways: hop, spin, crawl, etc. Invite children to complete the obstacle course while holding a ball in their hands. Throwing a ball is an important skill that children must develop. Show children how to throw a ball and encourage them to practice by organizing simple friendly competitions. Encourage right-handed children to try to throw a ball with their left hand (and vice versa), have three children stand in a triangular formation to throw the ball to each other, etc. Use sidewalk chalk to draw a giant hopscotch grid on the ground in your yard. Encourage children to toss a small ball on the hopscotch grid as a marker. Set your bowling pins on a low table in a corner of your backyard. Each child has three chances to toss a ball towards the bowling pins, trying to make them all fall down. If you don't have bowling pins, you may simply use empty plastic bottles. To increase the level of difficulty, set the bowling pins directly on the ground. For this game, help each child find a partner. They must stand just a few feet away from each other. The goal of the game is for children to successfully toss the ball back and forth without moving their feet. Count how many times each team tosses the ball before it falls to the ground. Divide your group into teams of three players. The players from each team form a straight line. The players at each end of the line face each other and throw the ball back and forth. The child in the middle must try to intercept the ball. With very young children, be sure to have players trade places frequently to avoid the child in the middle getting discouraged. o	Set a garbage can approximately 6 feet away from the starting point. Children must toss a ball inside the garbage can. Count how many tosses they require before succeeding. o	Set your fabric tunnel on the ground. Children must roll a ball through the tunnel. o	Hang a hula hoop from a piece of playground equipment and encourage children to throw a ball through it. 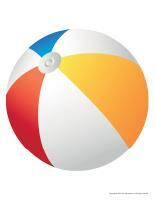 o	Set a beach ball approximately six feet away from the starting point. Children must hit it with another ball. Collect metal cans in a variety of different sizes. Stack them on a table to create a pyramid. Children have three chances to throw a ball towards the pyramid and make all the cans fall down. Set several hula hoops on the ground, leaving approximately 12 inches between them. Children each have five chances. They must throw a ball, attempting to make it land in one of the hula hoops. If you wish, you can associate a specific number of points to each hula hoop. Add up the number of points each child makes to determine a winner. This is a simple low-cost activity for young children. Cut strips of felt or cardboard. Let children decorate them (glitter glue, paint, markers). Glue the strips of felt around metal cans and stack them to create a pyramid. Encourage older children to throw a ball towards the pyramid to make it fall down. Younger children can simply roll a ball towards the pyramid or even use their hands to make the cans fall down. If you wish, you can increase the level of difficulty for older children by asking them to roll the ball while facing backwards, push it with their foot, etc. 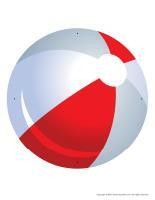 (Open lacing-Beach balls) Print, laminate, and punch holes around the contour of each shape. Encourage children to thread string or ribbon through the holes. 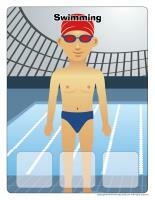 (Open association game-Summer Olympics) Print, laminate, and display on a wall, at children's eye level. Have children use adhesive putty or Velcro to associate the small illustrations to the correct sport. 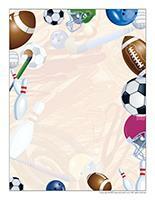 (Open educ-math-Sports) Print and laminate for durable, eco-friendly use. Children must count the objects in each rectangle and circle the corresponding number. 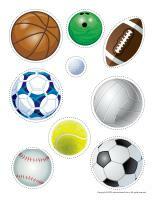 Collect different types of balls associated with various sports. Ask children which ball they think will bounce the highest, which one will bounce the least, which one won't bounce at all, etc. Ask children what they think would happen if you inserted a needle in a balloon. Why do balloons pop? This experiment must be performed by the early childhood educator since it involves the use of needles that can be dangerous for little ones. The balloon does not pop because the adhesive tape plays the role of a seal around the needles and prevents the air from exiting the balloon. The balloon will only pop if the air finds a way to suddenly exit the balloon. If children are old enough and if they are not easily scared, you may perform the experiment backwards by popping balloons different ways. For example, insert needles in balloons without applying adhesive tape or by exerting pressure on them. Prepare cupcakes or muffins with your group and invite them to use colourful icing to decorate the balls to represent soccer balls, basketballs, volleyballs, footballs, etc. Serve the cupcakes at snack time. (Open puppets-Balls) Print the puppet models on heavy cardboard. Invite children to cut them out and decorate them with various materials. Attach a Popsicle stick to the back of each model to create a puppet. (Open models-Balls) Print the various models and use them for your activities and projects throughout the theme. (Open balls for sports) Print and have children choose the model they prefer. Encourage them to cut it out. If you prefer, you may also simply trace a circle on a white piece of paper, have children cut it out, and provide black and white paint they can use to turn it into a soccer ball. (Open balls for sports) Print each ball twice. Staple matching balls back to back, leaving an open space at the top of each one. Fill the shapes with newspaper, cotton balls, or other materials. Once the balls are fully stuffed, staple the portion you had originally left open and hang them from the ceiling within your daycare. 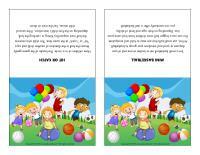 (Open coloring pages theme-Balls) Print for each child. 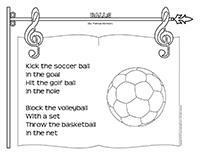 (Open songs & rhymes-Balls) Print.